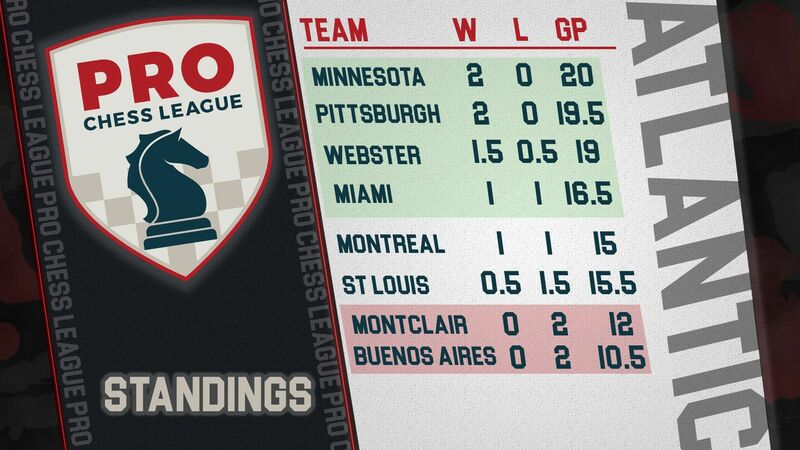 The Pittsburgh Pawngrabbers are just one of two undefeated teams in the PRO Chess League’s Atlantic Division after tonight’s win over the Montreal Chessbrahs. The Pawngrabbers were solid throughout the match, increasing their margin over the Chessbrahs every round to finish 9.5-6.5. The other undefeated team is the Minnesota Blizzard, who edge us out in game points after pummeling Buenos Aires 11.5-4.5. We’ll have to fix that when we face off next week! 14-year old GM Awonder Liang was the undisputed hero of the night, crushing the Montreal lineup 4-0. He was the only one to defeat GM Robin van Kampen in an overwhelming kingside attack. GM Eugene Perelshteyn joined NM David Hua and Isaac Steincamp on air to give his take on the game. Awonder didn’t let up next round against IM Michael Kleinman, who was duly punished for an cheeky …Bh5 in a two-knights Caro Kann. GM Alexander Shabalov didn’t quite live up to his performance from last week, but found a way to get the points when it mattered. IM Michael Kleinman managed to swindle Shabalov from a completely lost position in time trouble, but Shabalov returned the favor by swindling GM Aman Hambleton in the next game. Shabalov’s chances were also looking bleak in Round 4, but stayed alert to the end against GM Robin van Kampen to snag the fateful 8th point for the Pawngrabbers and end the night 2-2. IM Atulya Shetty returned as Pittsburgh’s #3 this week, and scored a respectable 2-2 with wins over the Montreal IMs. Some solid technique on display against IM Michael Kleinman in a tricky ending. Last week, Pittsburgh showed its strength in lower boards, and that didn’t seem to change much with the introduction of SM Mika Brattain, who replaced FM Edward Song as the Pittsburgh #4 this week and matched his score of 1.5 points tonight. The Pawngrabbers took the lead after Round 2 courtesy of Mika’s win over IM Renier Castellanos. Mika would go on to clinch the match with a last round draw against IM Michael Kleinman. Besides GM Liang’s amazing performance, what were the keys to winning the match? One theme that kept popping up was time management – we were noticeably better on the clock all around, and most importantly were generally able to keep that without compromising our quality of play. In a few cases, it netted us some unexpected points, such as in Round 2’s Shabalov-Hambleton. Several shoutouts this week, starting with the players themselves, and especially GM Awonder Liang for his 4-0 sweep – a difficult feat for any player. Thanks as always to Isaac Steincamp, David Hua, and GM Perelshteyn for another round of great commentary this week. Thanks also to Grant Xu for helping me with everything behind the scenes. With just two weeks of the season down, there is still plenty of chess to be played and plenty of time for the standings to change, but the Pittsburgh Pawngrabbers are in a very good spot at the moment with two strong wins. That said, next week we are up against the only other undefeated team – the Minnesota Blizzard, who we had two exciting matches with last season (we lost the first 9-7 and won the second 8.5-7.5). Both teams have proven their worth early on this season and we fully expect it to be a very tough match. Tune into our Twitch stream next Wednesday at 5:55 pm for the match!